Despite a fronting defense by Golden State’s Rony Turiaf and Andres Biedrins that usually works against Yao Ming, the Big Guy got back to the level we expected before his clunker of a game Wednesday night against the 76ers. Yao got Turiaf and Biedrins in early foul trouble, with both players picking up 4 fouls each by halftime while Yao racked up 10 points in the first two quarters on 5-of-8 shooting. Yao Ming blocks the shot of Rony Turiaf in Saturday’s win over Golden State. Click here for more game photos. Yao used his size difference, and their foul troubles, to his advantage by hitting 4-of-6 shots in the second half to finish with 25 points on 9-of-14 shooting overall to lead Houston to a 110-93 victory over the Warriors. Tack on 11 boards, and all is right with the world when Yao gets back to numbers like that where he belongs. 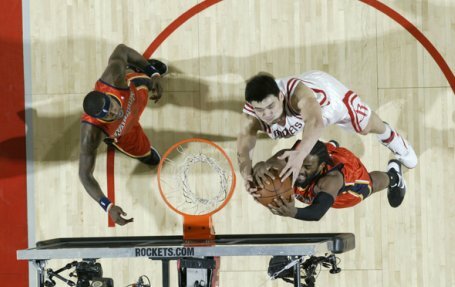 Yao did have 4 turnovers, with one coming off a charge that was a bogus call by the refs. Still, 3 TOs coming off mishandling the ball is three too many, but I can live with one of those per game from Yao. People may think that Golden State is a pushover team, but they’re still dangerous with explosive scorers like Stephen Jackson, Monta Ellis, Corey Maggette, and this year’s surprise for them, C.J. Watson. They shocked the Hornets on Friday night in New Orleans with an unlikely road victory, and it looked for a little while on Saturday night that they might be able to pull off another upset, but the Rockets finally got it going in the second half keyed by Yao’s 25 and Ron Artest’s 27. Without Tracy McGrady in the lineup because of a Yao-induced ankle injury, Rick Adelman decided to start Artest over Von Wafer. Like I knew he would (unlike McGrady), Artest bounced back and played a much better Saturday in comparison to his 7-of-29 shooting over his past two games. Artest took over in the 3rd quarter, scoring 12 points, and finished with 27 points on 10-of-17 shooting, 4-of-6 from 3-point land, 7 assists, and 7 rebounds. Anyone who thinks Artest is more disposable than McGrady, like I’ve seen some Houston columnists write lately, is off their rocker. But that’s a different topic for another day. Most of the scoring by Artest and his teammates didn’t come off crisp ball movement like we saw a couple of weeks ago. Many of those scores came from individual one-on-one plays and contested jump shots. I think that had to do with the fact that’s Golden State’s style, and the Rockets got caught up in it a bit. Unlike other games where they abandoned ball movement and passing, it worked in this game as evidenced by the end of the third quarter the Rockets being able to build a small 81-75 lead after shooting 58% in the quarter. Ultimately Golden State went cold at the start of the 4th quarter, and the Rockets kept hitting shots to put the game away. The fact the Rockets had 3 days off and the Warriors were playing the second night of a back-to-back might have had something to do with them fading in the fourth. But the Rockets have been in the reverse position many times themselves, so it’s hard to feel sorry for them. That’s the NBA for you. Part of the reason the Rockets won is because Adelman did something we rarely see from him. He pulled a starter who wasn’t doing very well, Rafer Alston (1-of-8 from the field), for Aaron Brooks, who had his best game in weeks. Brooks played almost twice the number of minutes (43) than Alston (22), and it paid off as Brooks tied a career-high in both points (22) on 8-of-19 shooting and assists (9). He also only had 2 turnovers. I love it when Adelman tries to get younger players involved, unlike his predecessor JVG. I think alot of Rocket fans were hoping that another youngster — Von Wafer — would get tons more minutes in place of McGrady so that his critics could bolster their argument that they need to go more with Wafer, who played so well during McGrady’s two-week absence, and resulted in the Rockets’ offense playing so much better as a team. Wafer played 16 minutes and scored 8 points on 2-of-8 shooting, with most of his minutes coming in the fourth quarter when the Rockets pulled away. Well, I’m happy that Brooks got lots of minutes, and I guess I can’t be too greedy that another up-and-coming player didn’t get the same kind of minutes in the same game. Speaking of young players, Carl Landry played the kind of game that enthralled us so much last season — hustle and attacking the rim. That energy really helped against an athletic Warriors team. Carl finished with 17 points on 6-of-8 shooting and 8 boards. He had 11 in the 4th quarter to spark the Rockets’ pulling away. His impact in the paint, combined with Yao’s, helped the Rockets finish with a commanding 48-22 differential in points in the paint. For good measure, Landry hit his first 3-pointer of the season in the final minute during garbage time. It was such a rarity, he got head pats and friendly shoves from smiling teammates, including Yao, as they walked off the court after the game ended. It’s funny what makes NBA players laugh sometimes. Since the Rockets are playing their next game against the Bulls in Houston, it’s likely that McGrady will play in that game. I don’t mind when McGrady doesn’t play because I think they play better without him, especially with Wafer’s emergence. But the silver lining is that maybe it will be a “showcase” game for McGrady so the Bulls can get a first-hand look at him. I’m just speculating, but I’m hoping that Bull’s chairman Jerry Reinsdorf will be looking to shake things up after saying Friday that this season for the Bulls has been “embarrassing” and a “disaster.” So maybe a change (“trade”) is in order for them? Is there anyone on the Bulls’ team the Rockets would want that’s reasonable in return for McGrady, and maybe also Luther Head thrown in? While we’re on the subject of trades, is Shane Battier so important as the Rockets’ “glue guy” and defensive stopper that they can afford to have a starter who hardly scores? Battier took 3 shots and finished with 0 points in 34 minutes. Just look at the point totals, rebounds and steals in his games this season here. Not very impressive. I really like Shane, but I’ve got to think Landry and Wafer deserve more of his minutes, and maybe they should use him more when he has to go against a big-time scorer like Kobe, or an opposing player his size who gets hot. We’ll see what happens as the trading deadline approaches on February 19th. This entry was posted on Sunday, February 1st, 2009 at 12:55 am	and is filed under vs. Golden State. You can follow any responses to this entry through the RSS 2.0 feed. I say it again. Brooks is the true answer for the position of PG in Houston. He is another AI in the offing. He looks like him and plays like him. Please trade Miss Tracy McLady. Thanks. How valuable is Ron Artest? Even with his off-court antics, when my Indiana Pacers had the best record in the league in 2004, outside of Reggie Miller, its leader was Ron Artest, not Jermaine O'Neal. Ron Artest always had the ball in crunch time and he delivered nearly everytime, either by going hard to the hoop or played hard nose defense on the opposing team's best scorer.